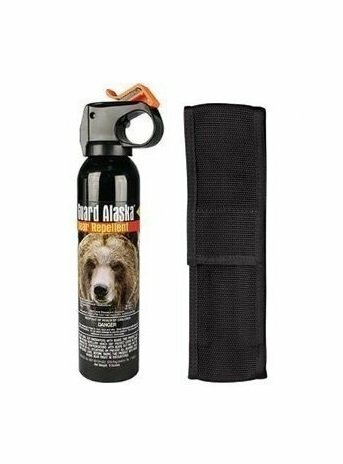 5 Best Bear Spray For Grizzlies Reviews: List & Comparison in 2019! Bear Sprays for Grizzlies: Product for Your Safety! If you live in an area that has a bear population, or if you are planning on a trip to a wild bear area, then you have to be prepared at all times. This does not mean you need to hold a 12-gauge shotgun and kill any furry creature that comes across your path. It means you need to be prepared to run while stopping the bear from attacking you if the case might arise. The use of a bear spray is humane, and also prevents you from killing an innocent bear that might seem aggressive just from appearance. Add to this the fact, that even when shooting a bear, you might only wound it and that will make it go all grizzly over your hide. Pepper spray is the best way to go; it will repel any bear, from an attacking grizzly to a docile black bear. A statistical (U.S. Fish and Wildlife Service report) fact is that when using a bear spray, 100% of the humans escape intact and without damage, while when using a gun, 50% of the time both the human and the bear will suffer injury or death. This review will cover the three important factors of a pepper spray canister: The % of capsaicinoids, the distance of the spray, and the amount of spray in the canister. These are the three key indicators of successful protection. In this review, I present to you a list of the best bear sprays on the market and will conclude with a FAQ as well as a short guide to handling bear with pepper spray. 2. 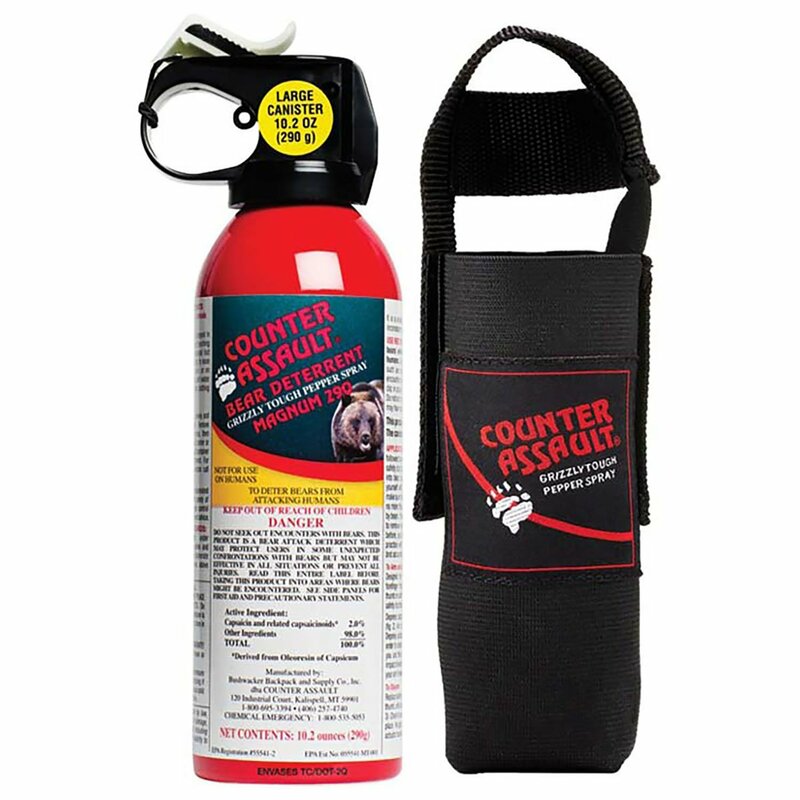 Counter Assault Bear Deterrent 10.2 oz. 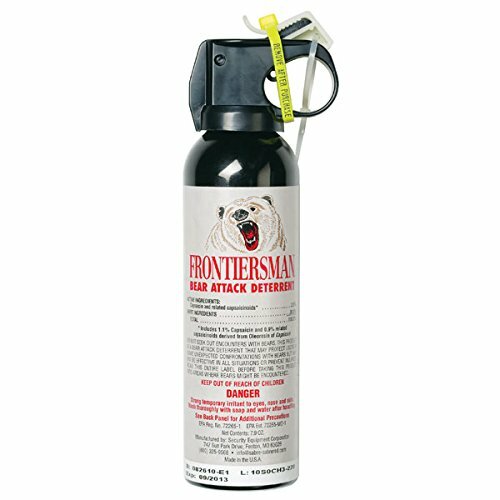 The Frontiersman bear spray is a tested and proven product with great support and an in-depth website that explains a lot about this product and how to deploy it. This is a standard canister size, easy to carry and provides the recommended range of 35 feet. The capsaicin percentage is maximum, set at 2%; this will deter all bears giving you time to escape. This is a great value for money option with a great dispersion and thick fog. The speed and power of deployment will stop any bear in its tracks. This is the Counter Assault® 10.2-oz. 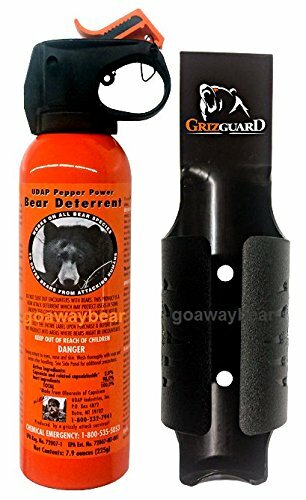 Bear Deterrent Spray that comes with a holster, so you get a larger sized canister with an easy to reach the application. This is EPA registered in all 50 states, and there is a 9-second continuous spray for 32 feet. This products larger content will give you at least 4 x 2-second bursts, which is great for assuring a safe retreat and stopping any bear from thinking of following you. The PSP Guard Alaska Bear Repellent Spray is a smaller canister, used for quick emission and fast retreat. It only covers a 20-foot range, so it has to be handled carefully. You need to wait until the bear is closer, but comes with a fair amount of spray, 9oz. The capsaicin is 1.34% concentration, that is on the lighter side of the maximum allowed, and is more humane. This pack with holster is a perfect combination of content volume and humane levels of power. The bear will stop after one blast, and you have at least 4 x 2-second blasts from this canister. The UDAP Pepper Power® Safety Orange Bear Spray comes with their Griz Guard Holster®. I just love all those flashy names for a simple holder and spray. Having quaffed at these marketing branded names, I have to state that this is an exceptional model and comes with a 30-foot range. The contents are smaller, only 7.9z but enough to enable a forced retreat out of harm’s way. The holster allows for an easier carrying and application process. The great thing about this holster is the ease at which you can get to your canister and deploy it. This model is powerful for long distances and has exceptional stopping power provided by the wide fog and cone-shaped spray pattern. Mace Brand Bear Spray is a brand-named spray and is the product of the world-famous Mace company. This is their bear version and has a 6-second full release over a 45-foot reach. This is a long release system and is one of the best on the market. This particular brand contains Oleoresin Capsicum in a pressurized canister that must be kept clear from flames. Mace is amazing, and this is just another of their branded products. You get 3 x 2-second shots delivered over the great distance of 35 feet. With Mace, you will be safe. 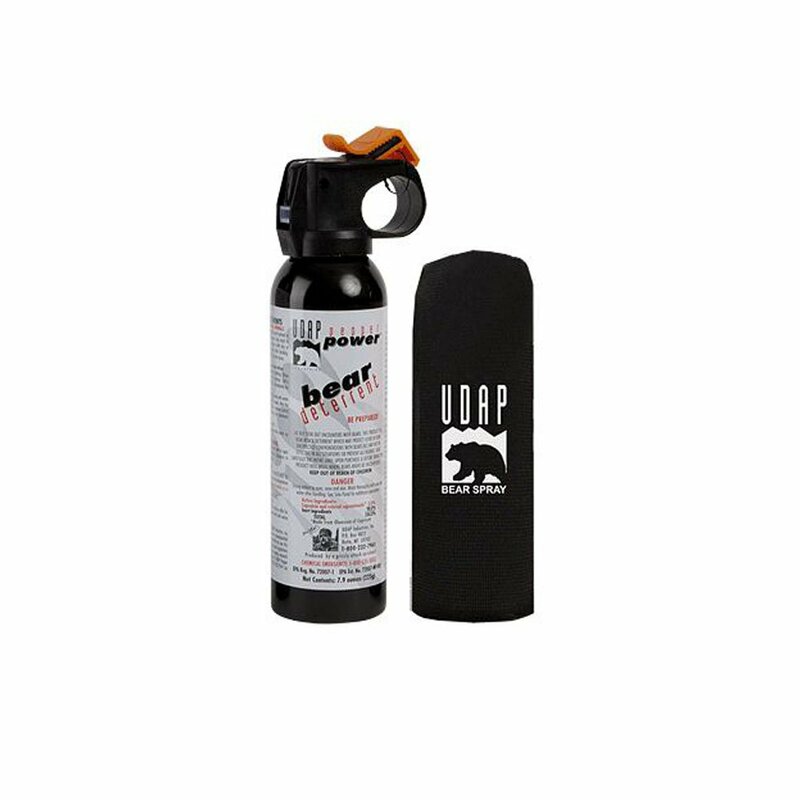 The UDAP #12 HP Bear Spray comes with a Hip Holster and has a 2% capsaicin content. This canister delivers a 30-foot spray and comes with its own hip holster for easy accessibility and application. UDAP is a leading brand in personal safety. This is a fast shooting package, so you only get 1 x 4-second shot or 2 x 2-second bursts. The reach is great, and the stopping power is high. Type: Must be “Bear” not other animals. How does bear Spray Work? 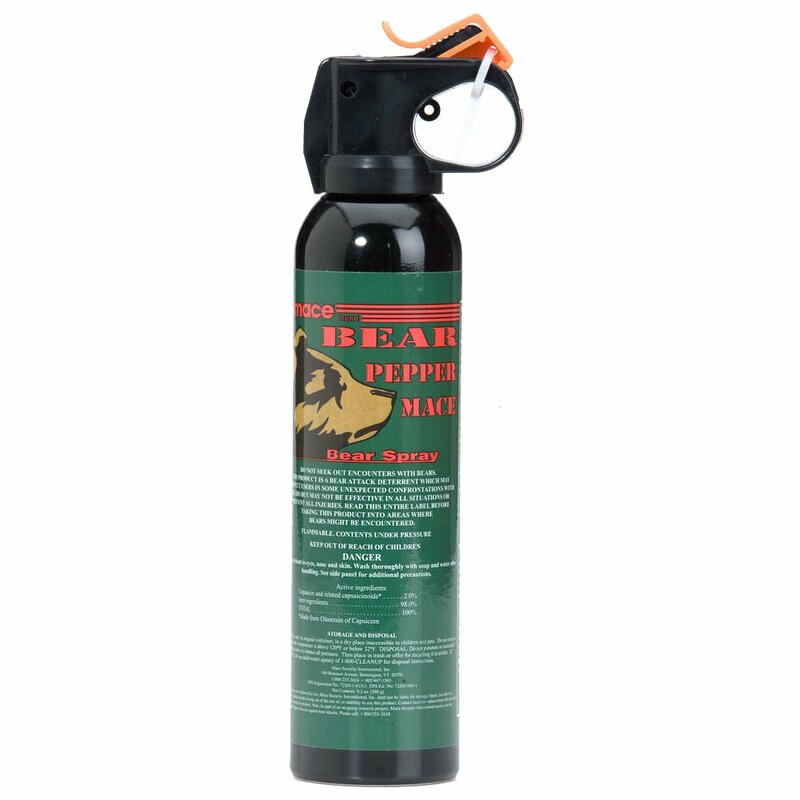 Bear spray is a mixture of atomized capsaicin (from red pepper) that is forced under pressure to reach up to 8 meters distance. The capsaicin content in the spray (fog) causes the membranes of the eyes, nose, and lungs of a bear to swell. This results in a temporarily blinded, and restricted breathing bear. Bears do not attack when under these conditions, and will either turn around or wait for the effects to wear off. This gives you plenty of time to leave the area. How do I use Bear Spray? Using bear spray requires three core functions, one is reachability, the second is an application, and the third is back up. This means that you should always have at least two canisters available, and wear it in an easy to access waist holster. There is no point in taking a spray and leaving it in your backpack. Speed is the necessary focus here. The bear will stop to clean itself or will retreat. This is the time you make your getaway, and do not run. NO RUNNING. Tip 1: Deploy the spray with clear hands, do not hold anything else, such as a hiking pole or bow saw or gun. Tip 2: Try one-second bursts, it can sometimes be more effective. When do I replace my bear spray? Bear sprays have a shelf life and also require specific storage requirements. In most cases, you must not store the canister in areas with temperatures above 50oC or below freezing. Both cases will cause extreme pressure differences that lead to canister leakage and degraded content. Its shelf life date is expired, and even if within 1 month to expiry. Bear spray is contained in a pressurized can and is explosive, and some bear sprays are made with flammable materials. Always follow the manufacturer’s instructions. Take note that carrying bear spray on an airplane is illegal, and should not be transported by commercial air, not on the person or in the baggage (where the depressurized environment can cause leakage and even explosion). It’s best to buy the spray at a local store. It can get into your hands and into your eyes, causing you to be affected. If the spray has been released, do not clean it up using water, this will only let the oil-based spray spread around without actually being cleaned up. Always be aware of wind speed and direction, just like the old sailor’s adage “don’t pee into the wind,” you don’t want the spray to come back to you because you sprayed it against the wind. This means, don’t panic when you see a bear. In some cases, the bear will ignore you, so you don’t need to fumble for the spray and release it immediately. Watch the bear, and then locate yourself in a downwind direction so that the spray effect will be maximized. On occasions, users will be affected by the spray. Sometimes wind directions change, or in very low or windless days, parts of the atomized spray will float into the user’s eyes. In this case, you have to consider two key factors. Did you get the bear first? If you have contact lenses, remove them. Take note that it usually takes around 15 to 20 minutes for the effects to subside, if they do not, get medical attention immediately. Where do I buy Bear Spray? You can buy it online, all the items I presented here can be bought online. Take note that I only presented you with the most reliable leading brand names. These products are confirmed as 100% compliant, and you will get a top-level product that you can rely on. If you intend to travel a long distance by air, do not buy before you arrive at your destination. Buy the product, one of those listed here, at a local store. Does using the spray make the bear mad? Actually no, bears will be so overcome with pain and confusions that they will run way in a panic and seek flowing water. However, if the animal is in pain from being shot/wounded, then it will continue to attack no matter how much spray you force onto it. This is why I stress, do not shoot a bear and then spray it. Only spray it. Can you use bear spray on dogs and humans? Bear spray is formulated for use on a bear, using it on a human or dog can be fatal. Nothing beats common sense. Common sense dictates the following. When you travel to bear infested areas, come prepared. This means come with all the fun and excitement of a great wilderness holiday, but account for the wildlife and remember, this is their home, not yours. Bear spray is a great product, it is environmentally friendly and will save both yourself and the bear. Top-Rated Smell Proof Backpacks: An Ultimate List! Lawn Tractors for Snow Blowing: Main Characteristics!